So you've been asked to parse some dates, except the years are two digit years. For example, dates like "12 Jun 30" are ambiguous...or are they? If "12 Jun 30" is intended to express a birthday, given it's 2019 as the of writing of this post, we can assume it means 1930. But if the input is "12 Jun 18" is that last year, or is that a 101 year old person's birthday? For example, if this property is set to 2029, the 100-year range is from 1930 to 2029. Therefore, a 2-digit value of 30 is interpreted as 1930, while a 2-digit value of 29 is interpreted as 2029. The initial value for this property comes out of the DEPTHS of the region and languages portion of the Control Panel. 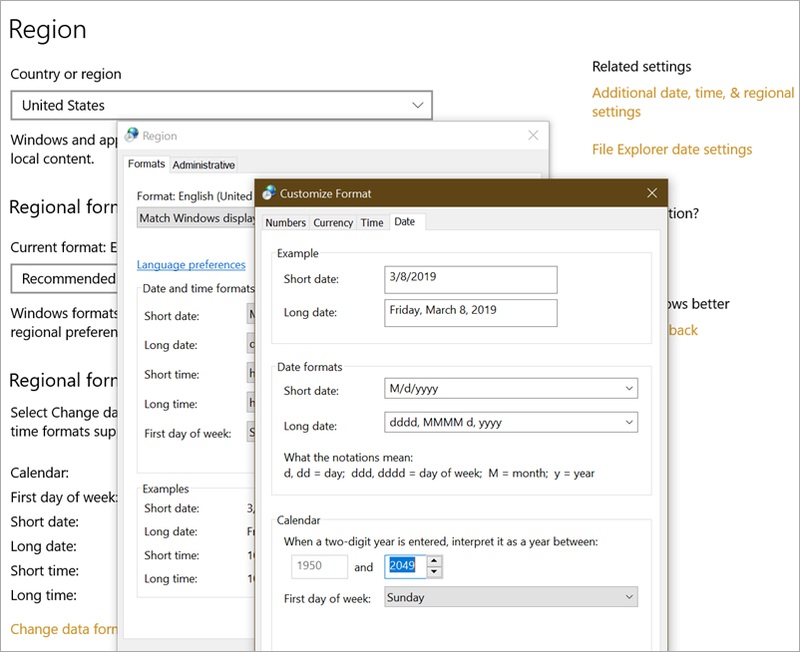 Note way down there in "additional date, time, & regional settings" in the "more settings" and "date" tab, there's a setting that (currently) splits on 1950 and 2049. If you're writing a server-side app that parses two digit dates you'll want to be conscious and explicit about what behavior you WANT so that you're not surprised. Setting TwoDigitYearMax sets a 100 year RANGE that your two digit years will be interpreted to be within. You can also just change it on the current thread's current culture's calendar. It's up to you. Note that I've changed TwoDigitYearMax from and moved it up to the 1999-2099 range so "30" is assumed to be 2030, within that 100 year range. Sponsor: Stop wasting time trying to track down the cause of bugs. 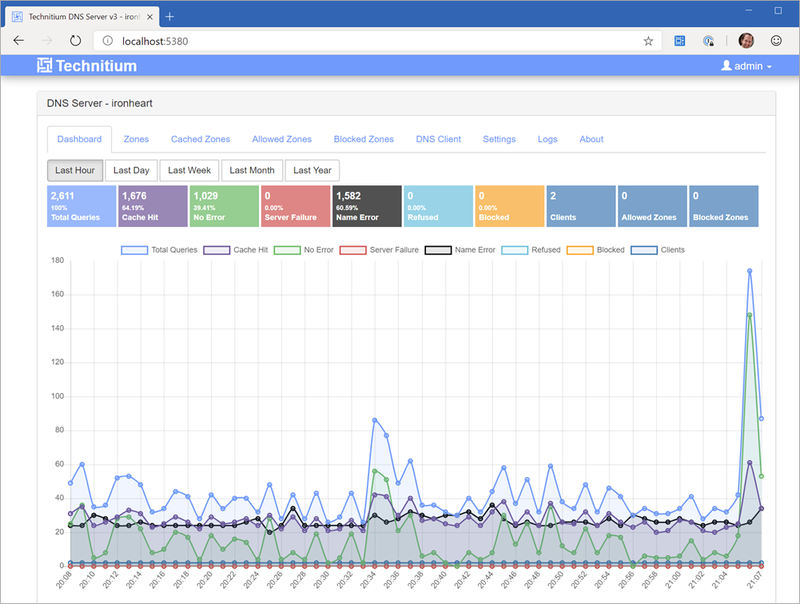 Sentry.io provides full stack error tracking that lets you monitor and fix problems in real time. If you can program it, we can make it far easier to fix any errors you encounter with it. HOWEVER. 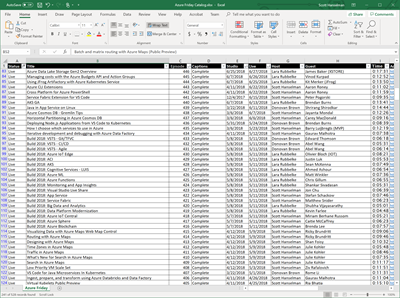 I don't have access to the database that hosts the metadata and while I'm trying to get at least read-only access to it (long story) the best I can do is a giant Excel spreadsheet dump that I was given that has all the video details. This, of course, is sub-optimal, but regardless of how you feel about it, it's a database. Or, a data source at the very least! Additionally, since it was always going to end up as JSON in a cached in-memory database regardless, it doesn't matter much to me. In real-world business scenarios, sometimes the authoritative source is an Excel sheet, sometimes it's a SQL database, and sometimes it's a flat file. Who knows? What's most important (after clean data) is that the process one builds around that authoritative source is reliable and repeatable. For example, if I want to build a little app or one page website, yes, ideally I'd have a direct connection to the SQL back end. Other alternative sources could be a JSON file sitting on a simple storage endpoint accessible with a single HTTP GET. If the Excel sheet is on OneDrive/SharePoint/DropBox/whatever, I could have a small serverless function run when the files changes (or on a daily schedule) that would convert the Excel sheet into a JSON file and drop that file onto storage. Hopefully you get the idea. The goal here is clean, reliable pragmatism. I'll deal with the larger business process issue and/or system architecture and/or permissions issue later. For now the "interface" for my app is JSON. So I need some JSON and I have this Excel sheet. Turns out there's a lovely open source project and NuGet package called ExcelDataReader. There's been ways to get data out of Excel for decades. Literally decades. One of my first jobs was automating Microsoft Excel with Visual Basic 3.0 with COM Automation. I even blogged about getting data out of Excel into ASP.NET 16 years ago! Today I'll use ExcelDataReader. It's really nice and it took less than an hour to get exactly what I wanted. I haven't gone and made it super clean and generic, refactored out a bunch of helper functions, so I'm interested in your thoughts. After I get this tight and reliable I'll drop it into an Azure Function and then focus on getting the JSON directly from the source. A few gotchas that surprised me. I got a "System.NotSupportedException: No data is available for encoding 1252." Windows-1252 or CP-1252 (code page) is an old school text encoding (it's effectively ISO 8859-1). 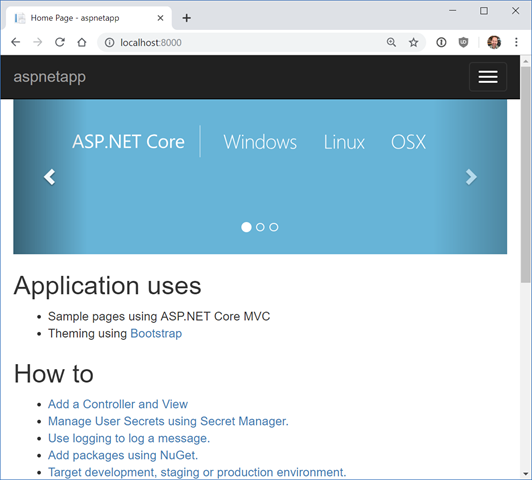 Turns out newer .NETs like .NET Core need the System.Text.Encoding.CodePages package as well as a call to System.Text.Encoding.RegisterProvider(System.Text.CodePagesEncodingProvider.Instance); to set it up for success. Also, that extra call to reader.Read at the start to skip over the Title row had me pause a moment. reader.Read(); //SKIP FIRST ROW, it's TITLES. Thoughts? There's a dozen ways to have done this. How would you do this? Dump it into a DataSet and serialize objects to JSON, make an array and do the same, automate Excel itself (please don't do this), and on and on. Certainly this would be easier if I could get a CSV file or something from the business person, but the issue is that I'm regularly getting new drops of this same sheet with new records added. Getting the suit to Save As | CSV reliably and regularly isn't sustainable. "EditorConfig helps maintain consistent coding styles for multiple developers working on the same project across various editors and IDEs." Rather than you having to keep your code in whatever format the team has agreed on, you can check in an .editorconfig file and your editor of choice will keep things in line. If you're a .NET developer like myself, there's a ton of great .NET EditorConfig options you can set to ensure the team uses consistent Language Conventions, Naming Conventions, and Formatting Rules. Language Conventions are rules pertaining to the C# or Visual Basic language, for example, var/explicit type, use expression-bodied member. Formatting Rules are rules regarding the layout and structure of your code in order to make it easier to read, for example, Allman braces, spaces in control blocks. Naming Conventions are rules respecting the way objects are named, for example, async methods must end in "Async". If you're using Visual Studios 2010, 2012, 2013, or 2015, fear not. There's at least a basic EditorConfig free extension for you that enforces the basic rules. There is also an extension for Visual Studio Code to support EditorConfig files that takes just seconds to install. ASIDE: If you are looking for a decent default for C#, take a look at the .editorconfig that the C# Roslyn compiler team uses. I don't know about you, but my brain exploded when I saw that they used spaces vs tabs. But! 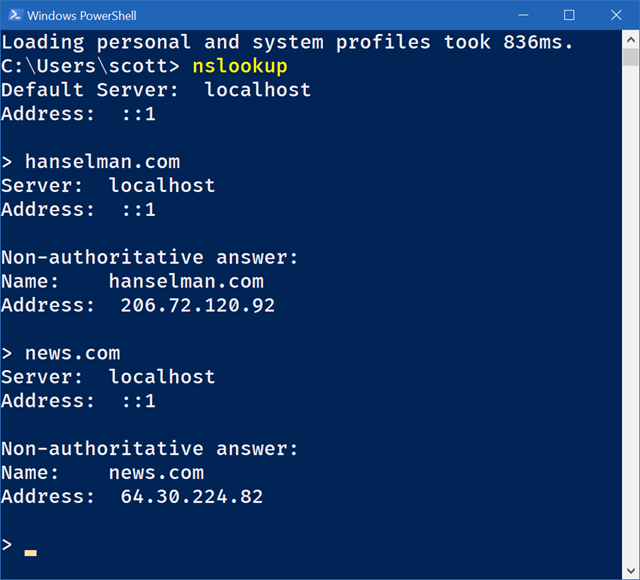 What if you want this coding formatting goodness at the dotnet command line? You can use "dotnet format" as a global tool! It's one line to install, then it's available everywhere for all your .NET Core apps. Tool 'dotnet-format' (version '3.0.2') was successfully installed. Formatting code files in workspace 'D:\github\hanselminutes-core\hanselminutes-core.sln'. Formatting code files in project 'hanselminutes-core'. Formatting code files in project 'hanselminutes.core.tests'. Of course, dotnet format is all open source and up at https://github.com/dotnet/format. You can install the stable build OR a development build from myGet.